Clark's portable boxes can be configured to meet your needs in Audio, Video, Data / Networking, Telecommunications and more, using Multipin connectivity or Multi-Channel Snake Cables. Custom Assembly Department provides per your specifications. Plug in your laptop, power up your projector, plug in your microphone, or just access a cable for your computer, the T3U handles it gracefully and efficiently. Available in a variety of finishes (black, brushed brass, brushed bronze or brushed nickel), these unique table boxes match your décor with style. 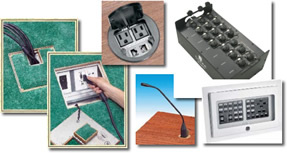 Constructed of finely finished metals, the units offer a variety of connection possibilities using interchangeable mounting plates and connectors. The steel construction makes these Wall boxes extremely sturdy. Available in several sizes to accomidate your needs. They are your solution for power, audio, video, telecommunications, data and more. The MWB-15 mounts a 15” LCD 1024 x 768 computer monitor (without built-in speakers) in any standard construction 16” on-center stud wall. MWB-15 saves time and money in construction and installation costs, and provides a finished look.